Much of our one acre is now planted: alliums of every type, an array of leafy greens, plus beans, beets, carrots, hakurei turnips, kohlrabi, peas, radishes. 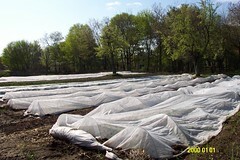 Some of these veggies are under agricultural row cover to speed their growth and/or to protect them from pests. 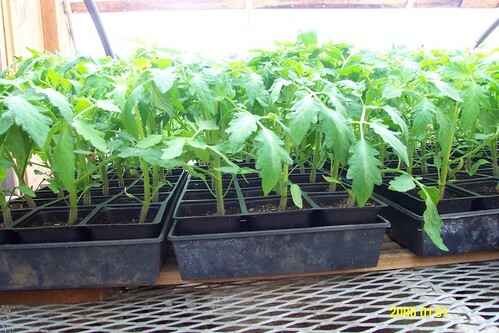 The hoop house is filled with tomato, eggplant and pepper seedlings and the next lettuce, herb and beet plantings. As you know it’s been a bit dry. Last week I noticed that some of the outer leaves on the lettuce were getting dry and crinkly, and crops in the drier part of the field had just stopped growing…..kind of silent protest against a mini-drought in April. Thank goodness for the rain! Our farm intern, Liz Green, has been introduced to woodchucking hunting and she’s really taken to it. For the most part, it seems the woodchuck population has been contained, although yesterday we did discover a dozen heads of lettuce that some critter (rabbit? woodchuck?) had devoured. These mostly-eaten lettuces were in the middle of the field. Very odd. The critters usually stick to the field edges where they can quickly run for cover when a hawk or human approaches. It looks like distribution of CSA shares will begin the third or fourth week of May. (I’ll contact shareholders by email as soon as I know the date of the first distribution.) I don’t think I’ll ever be able to predict exactly what will be in the CSA share — rabbits, woodchucks, weather have make accurate predictions difficult. That said, it looks like the first share will include spinach, arugula, lettuce, kale, bok choy and radishes. 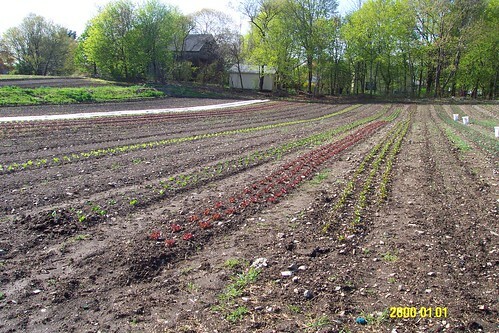 Beets, carrots, kohlrabi, scallions, pearl onions, hakurei turnips, parsley, dill, and cilantro should follow in early June. There’s about six weeks early in the spring when there’s room in the field for a lot more green stuff than my CSA can manage (around 10,000 more heads of lettuce than my 50 shareholders can eat!). I’m taking advantage of this by growing leafy greens all kinds — lettuce, napa, bok choy, kale — for Whole Foods in Fresh Pond, Medford and Woburn, and Formaggio Kitchen in Cambridge. Looks like we’ll start harvesting for these wholesale accounts in a couple of weeks. It will be a lot of work, but will bring in significant revenue for this one acre farm business. If you missed out on a Belmont CSA share this year, consider buying our produce at one of this stores. And if you prefer that your Belmont-grown vegetables be cooked and served to you, visit Kitchen on Common in Cushing Square, Belmont. 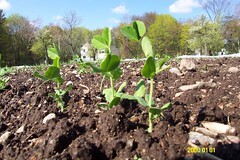 In the next few weeks our veggies will again be on the menu. Check out the Kitchen on Common Spring Harvest Dinner on May 18. This will be a fun and tasty way to explore new ways to prepare the veggies you will find in your spring CSA share or at the first Farmers’ Markets of the season. Chef Joh Kokubo, Kitchen on Common, will prepare dinner using local, in-season vegetables and herbs. Joh will join us, share his recipes and answer questions about cooking with spring vegetables. The Spring Harvest Dinner will be at Kitchen on Common, 442 Common St., Belmont , MA on May 18, 5:30-7:00 PM. The costis $30/adult, $20/child ages 6-15. Please call Kitchen on Common to make your reservations, (617) 484-4EAT.